Last night Mark and I gathered at ANF Annexe 1 (aka his place) to play our first game using the Impetus rules that he has recently purchased. 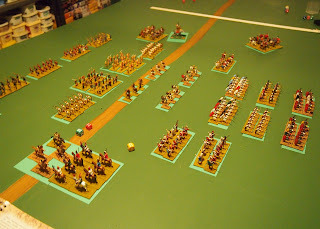 In about four hours—not including set-up time as Mark had kindly done that earlier—we played a medium-sized game (300 points each). We were impressed with the experience and will definitely be giving these a second go. The rules and table. 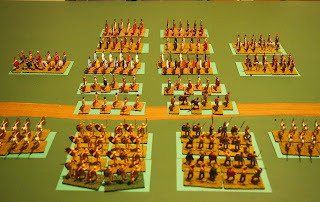 Carthaginians at left, Romans on the right. 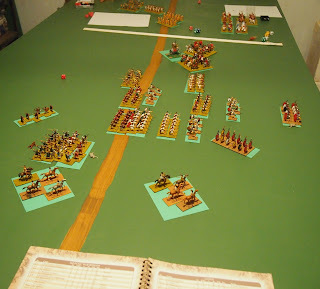 The white line at the top of the photo marks the table edged. I will not describe the rules in detail. If you are interested to learn more about them then I recommend this brief review on the Wargames Journal website and/or “Cpt Kremmen’s” excellent review on TMP. Also, in common with many rules nowadays, there is a basic, test version that can be downloaded for free. In brief though, the Impetus rules are based around units that are organised into commands, with each unit rated by a VBU (base unit value) and discipline (A, B or C class—not included in the basic rules). The VBU is particularly clever as one number is used to incorporate training, combat ability, armour and the like. As Cpt Kremmen points out in his review, this may not be to everyone’s liking, but to me, as one who has played a fair amount of ancients, but who is by no means an aficionado, they are create a system that is both elegant and quite unique. 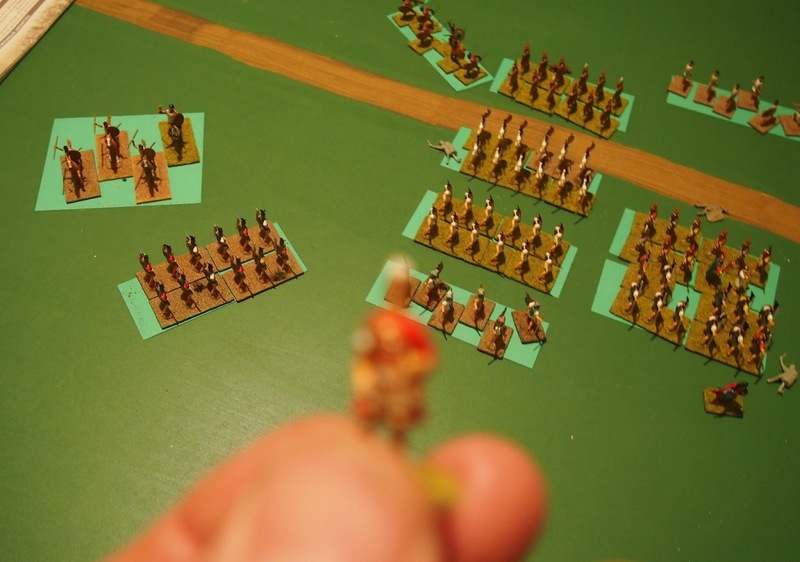 Units move by commands. This is determined by winning the initiative, which pits a selected command of one side against that of another. 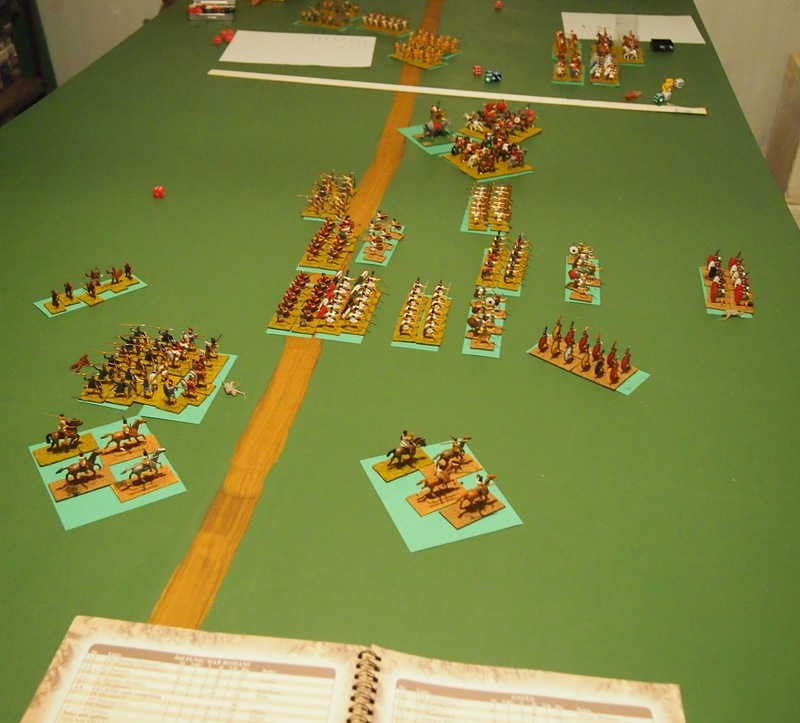 The result is decided predominantly by luck (2D6), to which is added the commander’s leadership (from 0 to 4—not included in the basic rules). The winner conducts all of the eligible/desired actions for all units in his command (in order rallying**, placing on opportunity (not in the basic set), moving, firing, mêlée). In the event of more than one command per side, there is then another initiative roll or, if only one per side (as we had) the opponent’s command is activated. A turn is completed once all commands of both sides have completed their activation, and the process begins again in the next turn. The combat/morale system is elegant and works well. Firing and combat use the same, two-step process. A unit's VBU +/- modifiers (things like range for firing, impetus bonus for charging, ranks bonus for large units, -1 for disorder) determines the number of dice that are rolled. Each 6 or pair of 5s is a potential hit. To determine if there is actual damage, the ‘target’ unit tests against its VBU minus the ‘hits’ inflicted by the other side (and a few other factors, such as disorder). If the die roll exceeds this modified VBU, then the unit suffers that amount of permanent “damage”. A unit can receive damage up to its VBU, at which time it is routed and removed from play. At first this seems a little complicated (as it likely does to you, dear reader) but, within a couple of turns we were happily working through the calculations without referring to the rules. Winning and losing is determined by the accumulated demoralisation value (VD) of routed units. Once a command loses half or more of the summed VD of its units in routed troops, then it breaks. It is also possible to break a command from a commander incident’ (see later). Enough of my “brief” description of the rules. On with a pictorial report of the game. 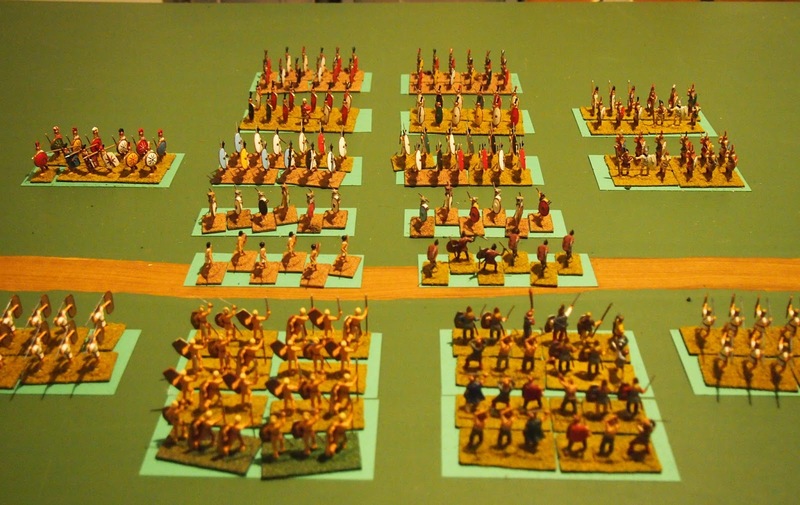 The Romans: Italian cavalry closest to camera, Italian infantry next to them, two legions (hastati, principes, triarii) with velites in front, another unit of Italian foot beyond them and then Roman cavalry (Hat and Zvezda figures painted by Mark). 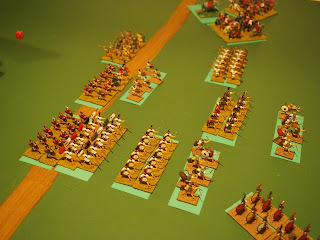 The Carthaginians: Numidian cavalry closest to camera, Iberian scutartii supported by Libyan spearman next, beyond them two large units of Gauls (warbands) with Numidian and Carthaginian skirmishers in front and Carthaginian spearmen behind them, Iberian scutartii supported by Libyan spearman beyond those units and, finally, a Cathaginian elephant and cavalry unit (Hat and Zvezda figures painted by Mark). Both commands were considered to have a 'good' command structure, but we rolled for the leadership bonus of the commanders. Mark's Carthaginian commander was rated as "expert"—Hannibal? 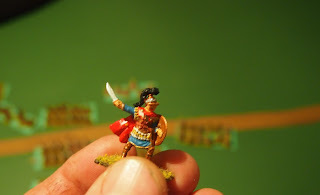 My Roman commander was rated as "fair". Early stages, both armies advance and we have a cavalry mêlée pitting Italian cavalry against Numidian cavalry. 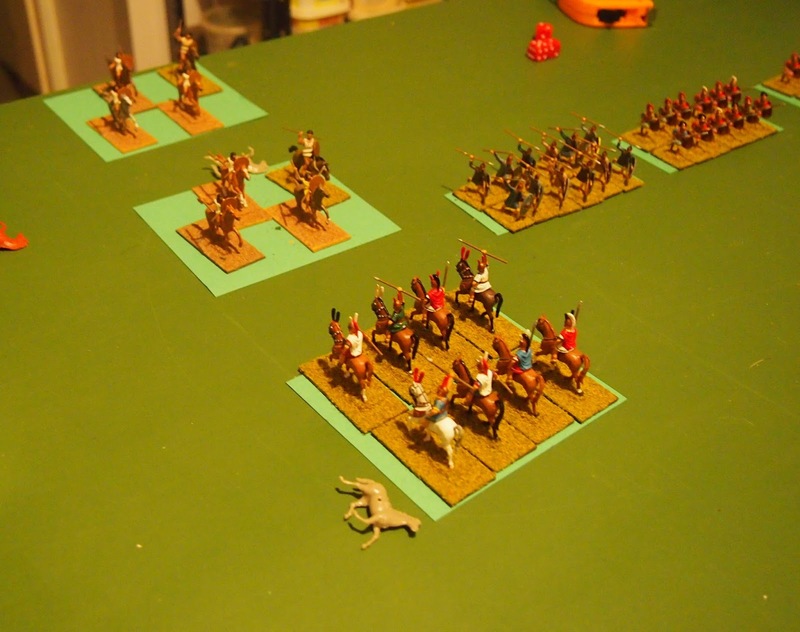 The Numidian cavalry were beaten and retreated beyond the unit supporting it. 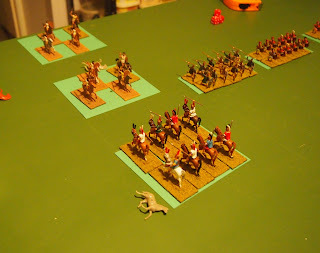 Note disorder marked beside Italians (lying horse). 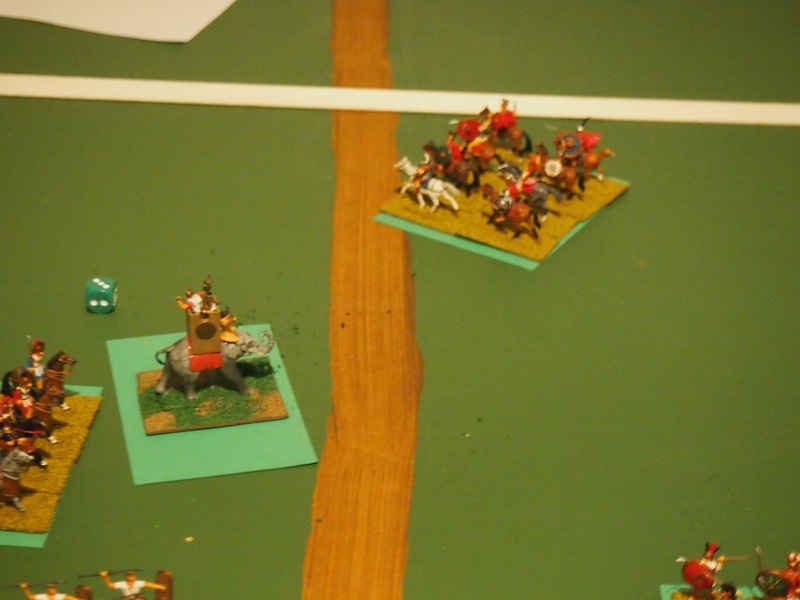 On the Roman right flank, the cavalry try to avoid that elephant! 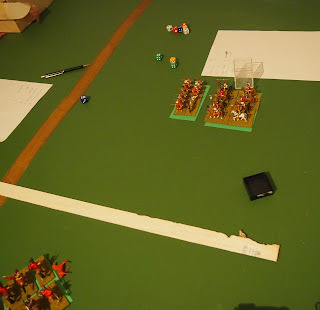 Meanwhile, in the centre, the skirmishers exchange fire while the infantry close. 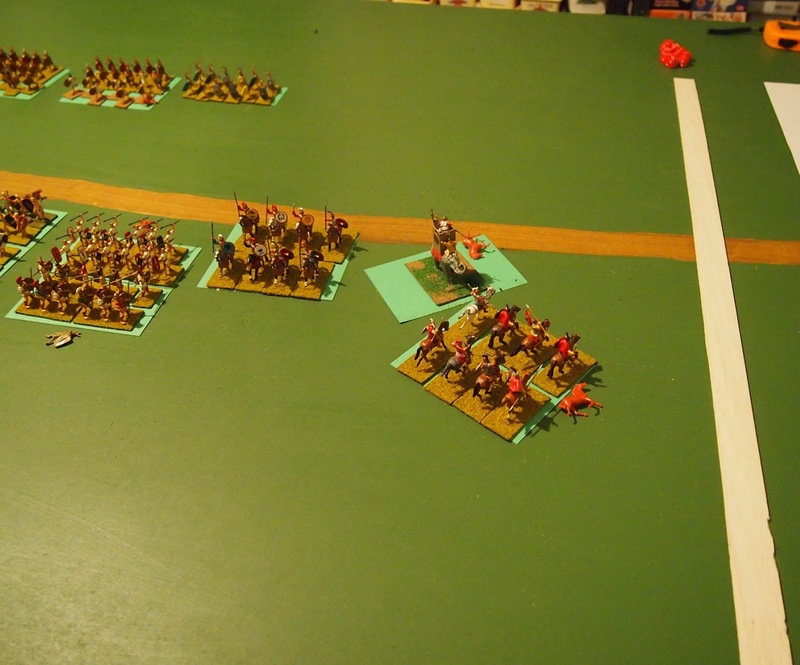 The skirmishers have now evaded as the Gauls crash into the hastati. 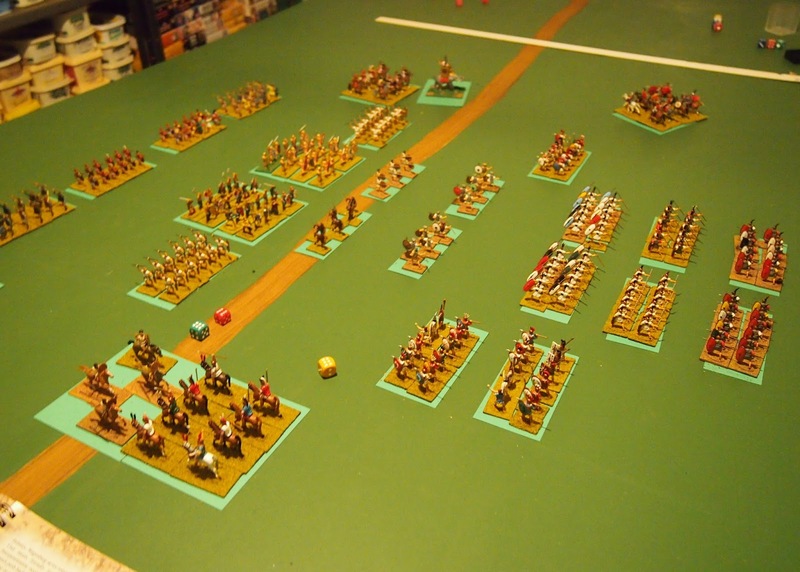 Disorder and damage mounts on the units of both sides on the Roman left flank. You can run, but not hide; here come those elephants! 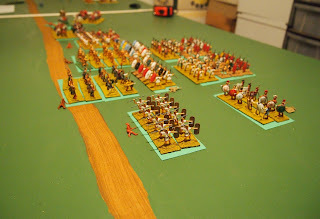 First routed units: Italian cavalry and foot from the Roman army. 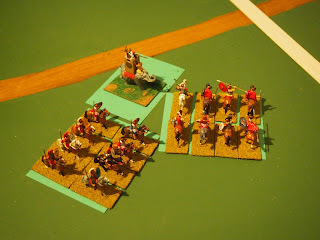 Routed units beginning to mount up: five a piece, thanks to the defeat of both units of Gaulish warband and one of Iberian scutartii for the loss of another Italian and a hastati. The greater VD of the units from the Roman army has them closer to breaking at this stage. 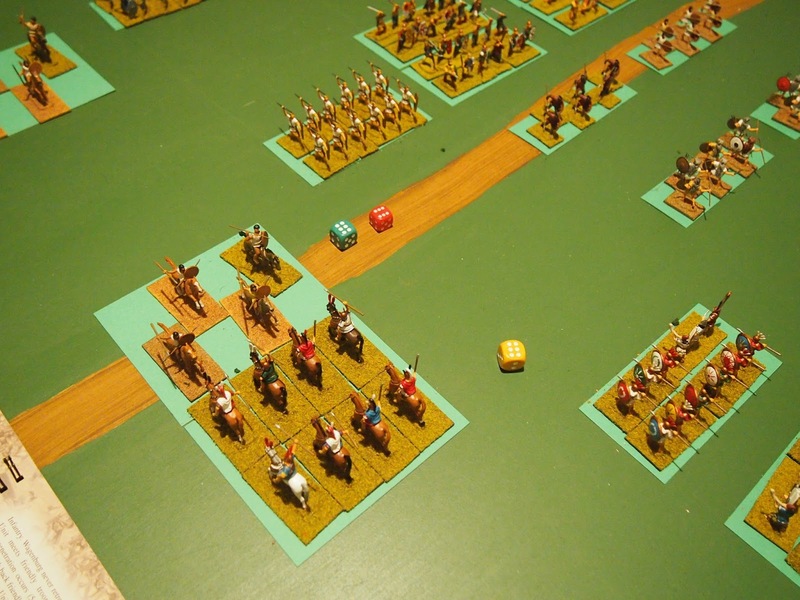 As the mêlée continues, Hannibal is worried that the elephant will not defeat the Roman cavalry alone, so sends in his Carthaginian horse too (also to see how a multiple-unit mêlée works!). 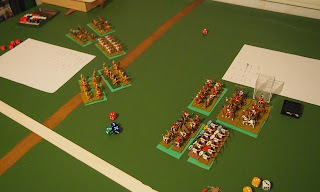 Despite the way it appears, neither of these units is on the flank as they did not begin their charge on the flank of the Romans. 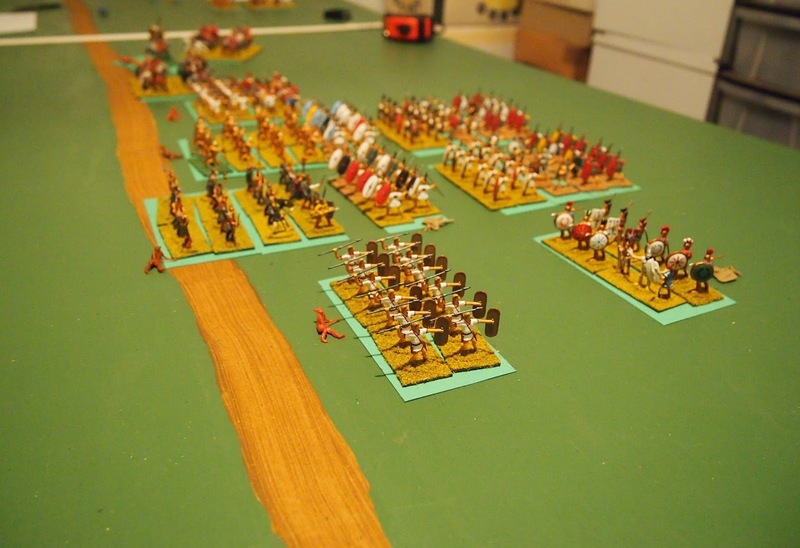 With the warbands routed, the Carthaginian spearmen come up against the legions (hastati in centre), while the remaining unit of Italians charge in against the right-hand unit of Libyan spearmen (left-front of photo) and the triarii face off the Numidian cavalry. 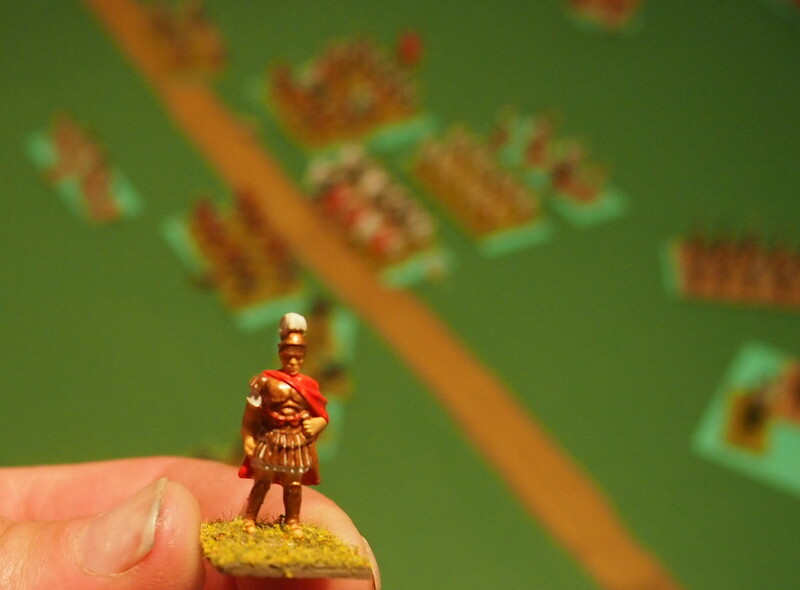 Close-up of the crucial infantry combat in the centre. 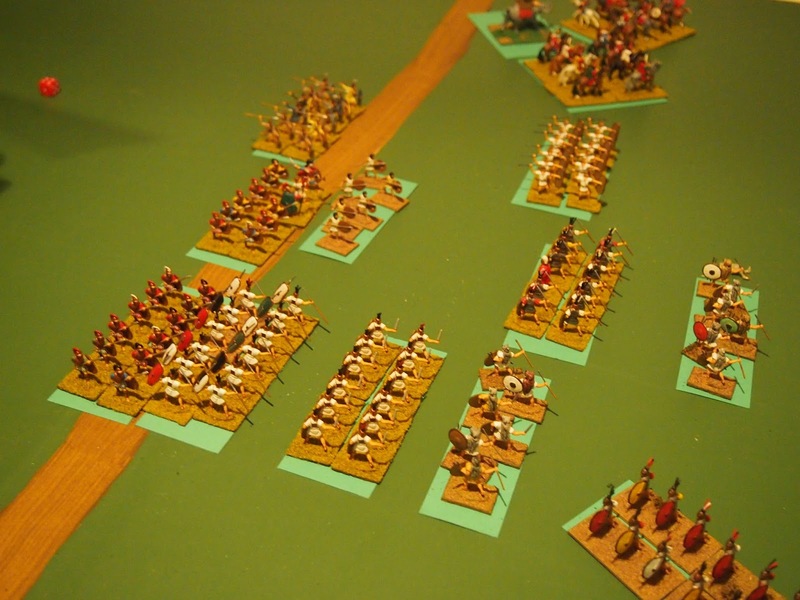 In a close fight the Carthaginian spearmen were beaten, but not broken. The shadow of the 'victor' cast over the final table-top. The unit of principes that he lead (centre-right of photo) defeated, but did not break, "Hannibal's" Carthaginian spearmen. Each commander had to complete a 'capture or death of a commander test'. The Roman commander, being only fair, had fewer positive modifiers (and rolled lower), so his result was "commander captured with no consequence for troops". In contrast, Hannibal, an expert commander, got the result "commander captured and command routed". Game over! So, the game ended with each side one point off breaking. 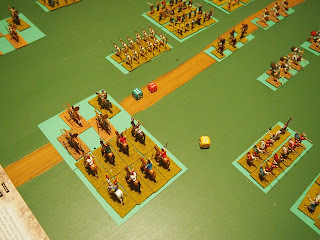 Had the command test not intervened, it would still likely have been a Roman victory as the remaining units were either fresh or only lightly 'damaged', whereas those of the Carthaginians were more "worn". As I mentioned above, we were really impressed with these rules. We rapidly became ‘familiar’ with them, which I thought was pretty good given that Mark had read them once and I had only read reviews! When we did refer to the rules, our questions were answered easily and clearly. 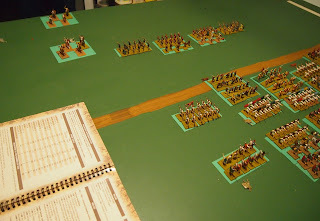 They generated a close and enjoyable game and were better than any other set of ancients rules that I have used (7th Edition WRG, DBM, Warhammer Ancient Battles). 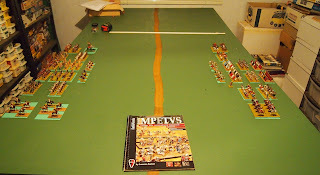 I suspect that we may want to add some ‘house rules’ (as Cpt Kremmen and his wargaming colleagues have—see his review on TMP). Irrespective of this, this seems to be a good set of rules as they stand and we’ll definitely be doing another ancients game using them, hopefully with the three of us involved. Interesting, and glad to see that you liked them. 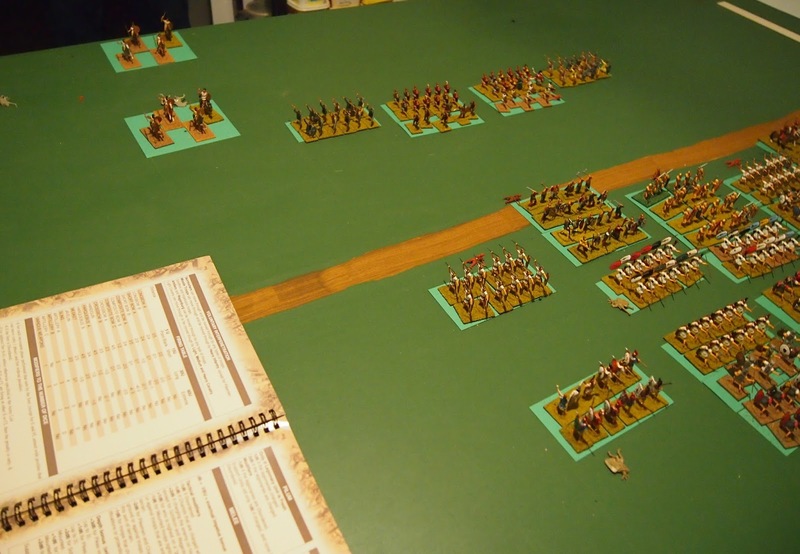 I have looked at the free version, but without putting troops on the table had a hard time [picturing how they would work in actual play.